In my previous article on strength training, I discussed how attention to posture during weight training optimizes movement patterns for force production and helps reduce overuse injuries. Moving to part 2 of this series, will hone in on the role that stability and mobility play in making strength gains. Mobility refers to the freedom of movement in joints through a range of motion. Stability is your musculoskeletal system’s ability to maintain its structure as the body moves, carries load, and transfers forces. Soft tissue must be trained to rotate, stretch, change direction and rebound back in order to execute movements efficiently. Adding a few simple exercises to your lifting routine will improve stability and mobility. I have a friend who insists on doing all home improvements by himself, instead of using specialists for the toughest parts of the work. He travels a lot for work, and has a wife and two toddlers in the house, so time for the projects is tight. His wife begs him to call a plumber or electrician for the most specialized jobs, but he insists on doing it all himself. During the project, he gets into numerous quarrels with his wife, other parts of the house usually get damaged, he obtains some sort of injury, the projects take much longer than intended, and he eventually gives in to call an expert. My friend could have avoided much pain, fatigue, and irritation if he called on the specialists in the first place. This situation illustrates what certain muscles and joints go through if they are called upon to perform tasks that the specialist muscles can’t do because of their immobility or instability. Those muscles that are trying to do it all will eventually get fatigued, irritated, or injured. The more mobile and supple your body is, the more each body part can expertly perform its specialized task. In running, a common example of a muscle group over-working is the hamstring. A strain or pull usually occurs in running because the hamstrings are performing tasks that the glutes should be doing. But when the glutes are not firing properly, the hamstrings pick up the slack. Proper function of the muscles in the hips, torso, and lower leg will relieve the hamstrings from overuse. 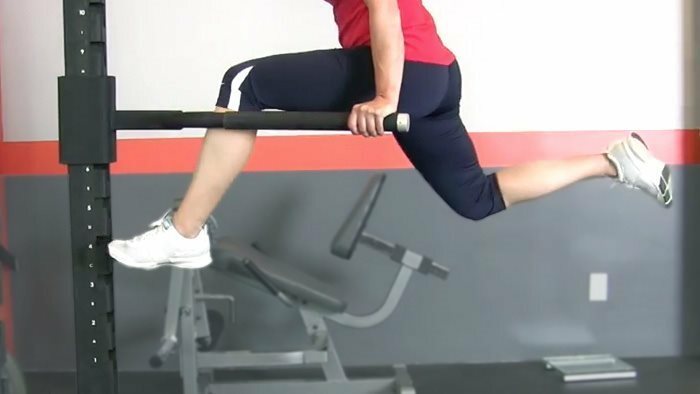 Lets look at some exercises for joints and muscle groups that play key roles toward optimizing mobility and stability. This list of exercises is not exhaustive, but does target some areas in the body that you may have not have considered essential to your stride efficiency. The stronger and more mobile these areas of the body are, the more efficiently you can move. Adding stability and mobility exercises to your strength routine will enhance your potential for strength gain, force production, and stride economy. You can definitely add more weight to these activities as you start to master them. You will love the extra range of motion and strength that your joints gain by performing these activities regularly.